No, this is not a tutorial (but I do have written the standard steps to learn below). 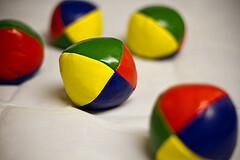 I began learning to juggle very recently. I just want to answer a possible "why"? I've always been fascinated by juggling, and every time I wanted to eat more than 2 small oranges I'd try my hand at juggling them. Always followed by bowing and picking them from the ground, of course. Even if I know it sounds lame, start with one ball, from hand to hand. You have to get a knack for the height and arch. The throw is not up, but up and to the direction of your other hand. Every time you throw, think "throw". When you are confortable with one-handed throws, pick a ball in each hand. Throw your first as before, and as soon as the ball reaches its maximum height, throw your other ball as before (and think "throw" as we did before). Repeat this an awful lot. Get the hang for the timing, height and getting used to thinking "throw". But what's the point? Of course, it's fun to watch, and maybe it is fun to do for a while. But, in the long term? I can't be sure, I'm just a data point and I've been in it for just shy of 3 weeks (on and off, since in July I'm doing quite a lot of The Fancy Puffin work and it cuts my "fun" time.) But this is what I found. After a few days I noticed something else. My back felt straighter, and I had less back and shoulder pain. When you are juggling you have to keep your back very straight, stand up and move your arms. Something most programmers and people working with computers don't. I don't know if both these secondary effects will last long. But I thought some other fellow geeks would be interested.